Devdan Show Bali Nusa Dua Theatre - The Treasure of the Indonesian Archipelago. C seat is 60 cm seat with wing view. Devdan Show Bali Nusa Dua Theatre - The Treasure of the Indonesian Archipelago. B seat is 60 cm seat with good view. 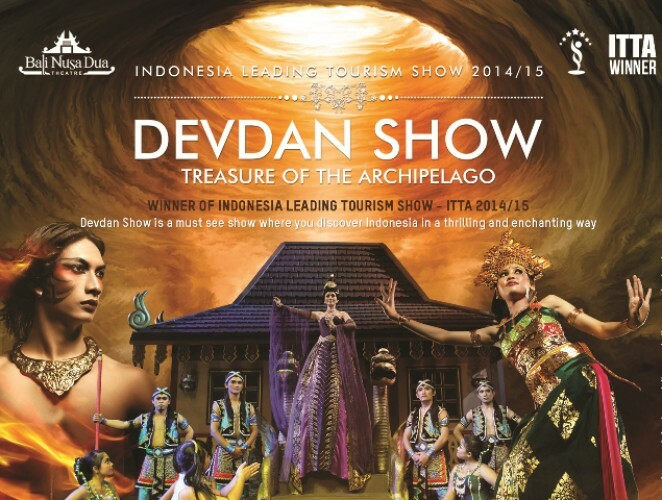 Devdan Show Bali Nusa Dua Theatre - The Treasure of the Indonesian Archipelago. A 60 cm seat with prime view and return transfer to hotel (min 2 adults). Experience Sacred Bali, Exotic Papua, Mystical Borneo and many more dazzling mix of dancing, acrobatics, costumes; illusions with captivating sound, lighting; special effects modern and air conditioned theatre, great for families entertainment. Located within shopping and restaurant area, and 5 minutes walking distances from 5 star hotel complex Nusa Dua.